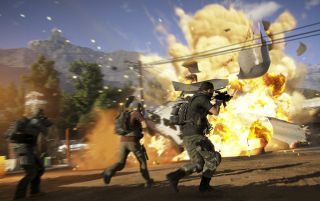 Prep your PC for tomorrow's Ghost Recon Wildland's launch. AMD just released a new Crimson ReLive 17.3.1 driver that is now available to download. The latest driver comes a day ahead of the release of Ghost Recon Wildlands and offers game day launch support for Ubisoft's open world shooter, along with up to a six percent bump in performance compared to ReLive 17.2.1. Not too shabby for a simple driver update. That six percent figure is specific to Radeon RX 480 graphics cards. It's not clear if the performance gain on other cards will be quite as significant, but either way, this is the driver to use if you plan on playing Ghost Recon Wildlands. It also includes a multi-GPU profile for the game. Battlefield 1 may experience flickering textures or terrain when returning to game after performing a task switch. For Honor may experience flickering or corruption on character models when highlighting them in menus. For Honor may experience texture flickering in Multi GPU enabled system configurations. System may fail to reboot when “Restart Now” is selected during a custom Radeon Software install. Borderless Fullscreen mode and AMD FreeSync technology may experience stuttering or flickering on some multi display system configurations. Radeon ReLive is not functional when Hyper-V is enabled on Windows. Counter-Strike: Global Offensive may experience stuttering when using Radeon Chill. DOTA 2 may experience stuttering on some system configurations with Radeon ReLive enabled. We're still working on a full review of Wildlands, though in the meantime you can see our initial impressions by checking out our review-in-progress. We also have some thoughts on the game's performance and settings. As for the latest Crimson ReLive driver, you can grab it here.